The app is very user-friendly and complete. Here you can find the theme channels, missed programs, search, news items, and guide. Everything is within your reach through a couple of clicks or swipes. Classical music, jazz, electronic or world music, everything is nicely ordered and easily found. The app is super handy thanks to the big clear buttons and its simple navigation. 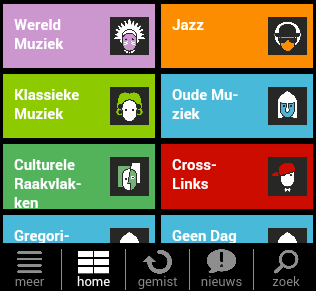 After you open the app, you’ll see the screen with all of our the theme channels. The app memorizes your preference, and it will appear on top the next time you use the app. A theme button will be added with festivals we stream live through our website. When you choose ‘Gemist’ from the menu, you can listen to the missed programs. If you want to go back even further, you can use the Search function and find all already aired programs as far back as 2007. Are you happy with de Concertzender app? Please rate it high in the App Store. This way the app will rank higher in the Radio category, it will be easier to be found and more people will be able to download it. The app is financially supported by Prins Bernhard Culture Foundation, designed by Kimmic Concept & Design and built by Van der Linden Cultural Services.